Thanks to jph for sharing one his unreleased creations with us, we now have a brilliant isometric take on the classic Wizard of Wor to enjoy. 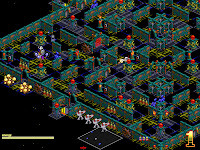 Return to Wor features gorgeous pixel graphics courtesy of Gabe Brooks, though many players feel be slightly disorientated at first due to the skewed view presented throughout the game. Nonetheless, everything works as it should and much of this is credited to jph's expertise at making old classics new again. As a Worrior, your task is to hunt down monsters in a maze-like dungeon with a unified field disruption rifle and several useful abilities not found in the original.